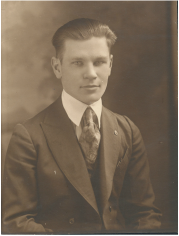 Cecil was born on 7 Dec 1899 in Pottawatomie County, KS. 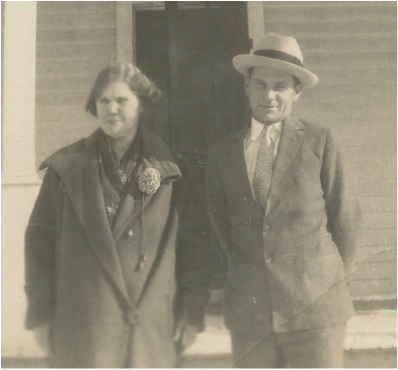 On 27 Jul 1931 in Topeka, KS, he married Velma Dolores Moody. Together they had two children. 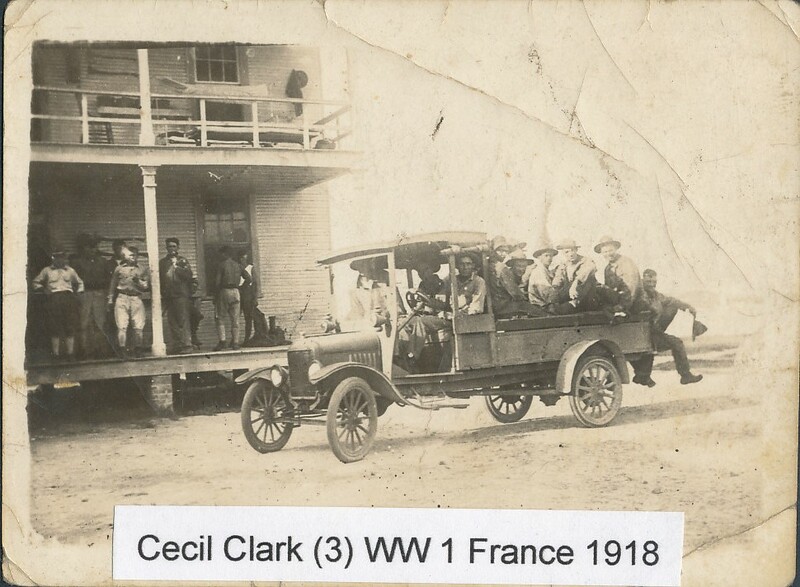 Cecil joined the Army in 1918 when he was eighteen years old. 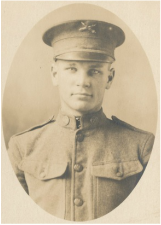 He served three years in France during WWI, then re-enlisted for another three years which he served in Hawaii. 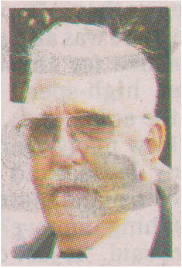 Cecil was a barber in the service, as well as in civilian life until he retired in 1962. Dolores was a school teacher from 1923 until she retired in 1967. Cecil passed away at the age of 71 on 5 May 1970. Cecil Clark - middle back. 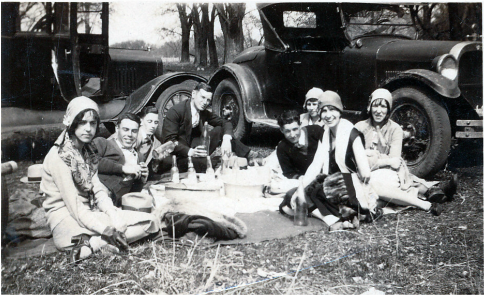 Is this a picnic in the country or an illegal moonshine party during prohibition? 10.1 - Marcia Joan Clark was born 23 Apr 1933 in Leonardville, KS. On 2 Feb 1951 in Pomona, CA, she married Roy Paul Smith (born 28 June 1927 in Arizona, died 12 May 2004 in Mira Loma, CA). Together they had two children. They divorced in 1959. On 31 Dec 1980, she married Sam Warren. Marcia was an administrator at a nursing home for many years. In later years, she and her 2nd husband, Sam, made art objects from cypress wood and sold them at art shows. Marcia passed away at the age of 66 on 29 Oct 1999 in Riverside, CA. 10.1.1 - Ronald Bryan Smith was born 23 Jan 1952 in Pomona, CA. On 6 Dec 1968 in Ontario, CA, he married Eva Mae Hill (born 29 Nov 1949 in Pomona, CA). Together they had one child. Ron was a fireman at the Rancho Cucamonga Fire Department. 10.1.1.1 - Ronald Jeffery Smith was born 9 Feb 1970 in Pomana, CA. 10.1.2 - Cynthia Renee Smith was born 11 Aug 1955 in Pomona, CA. On 14 Feb 1974 in Ontario, CA, she married George Edward Hurtado (born 1 Mar 1953 in Pomona, CA). Together they had two children. his two sons - Brad Clark of Cucamonga and David Clark (wife Shelley) of Ontario; 8 grandchildren - Jennifer Kurtz, Keith and Kristen Sutherland, Jessica Clark, Jamie Clark, Steven and Brittany Sandy, Andrew Velasco; five great-grandchildren - Ryan and Nolan Kurtz, Kaleb and Addison Sutherland, Landon Sandy. Visitation will be 5:00 to 8:00 pm on Thursday, February 12, 2015, at Stone Funeral Home. Services will be at 10:00am on Friday at Stone Funeral Home. Burial will be at Bellevue Memorial Park, Sunset Mausoleum, Ontario." 10.2.1 - Bradford "Brad" Joseph Clark was born 4 Aug 1956 in Pomona, CA. On 23 Aug 1975 in Claremont, CA, he married Tamara J. Thompson (born 24 Jun 1957 in Pomona, CA). Together they have one child. Brad is a steel worker and his wife, Tamara, is a legal secretary. 10.2.1.1 - Jennifer Lynn Clark was born 8 Dec 1976 in Pomona, CA. 10.2.2 - David Scott Clark was born 4 Aug 1958 in Pomona, CA. On 11 Oct 1980 in Ontario, CA, he married Donna Sue Fritz. David works for So-Co and is a reserve firefighter.